Hurricane Sandy was the perfect storm in so many ways, not the least of which was the level of sheer destruction that she left in her considerable wake. Few things have the destructive power of water, and if you have ever gotten a cell phone wet, then you know just how fast it can cause serious and lasting damage. Flood waters have the exact same effect on your vehicle's electrical system. Cars do not have to be swept away in order to be damaged; simply sitting in a couple of feet of flood water is enough to all but total the vehicle in short order. The engine's cylinders may become flooded, resulting in hydro-lock. This will cause the pistons to bend and the engine block to eventually crack. Even if the water is removed, the cylinders and pistons may still begin to rust, causing the engine to run unevenly and require almost constant oil refills. Water can also destroy the transmission of a car, which, of course, means that it becomes a very large and very expensive paperweight. The vehicle's electronic components may also be ruined, since we all know that water and electricity do not mix. Your car's power windows, power locks, electric seats, stereo system, GPS, and DVD are all at risk. If the car has been flooded, resist the temptation to try and crank it, since introducing electrical current to already wet components may completely destroy them. Air bags and seat belt performance may also be affected, making the car completely unsafe to drive in the event of a collision. Carpeting and upholstery may be saturated, and this has the same result in your car as it does in your home. Not only can the material be ruined by water, but the damage can give way to mold. Mold is particularly dangerous to your health in enclosed spaces, such as a home, or a car. Once mold is established, it becomes almost impossible to remove. To summarize, cars and trucks can be at risk for water and flood damage. 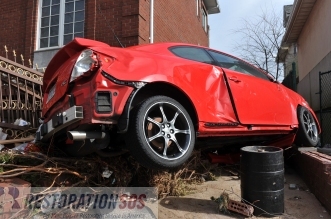 Whether or not they are totaled depends on your insurance provider and claims adjuster. As a general rule of thumb, cars are usually considered totaled if the flood waters reached higher than the floor of the vehicle. If you are unsure about the status of your vehicle, have it towed to a mechanic that you trust for an inspection. They will be able to examine the various components that are affected by water and make a determination as to whether or not the vehicle is salvageable. Also, remember that liability insurance does not cover against flood damage, so you should make sure that you have comprehensive coverage. This will make sure that you are properly compensated in the event your car is totaled out either by Sandy or the next major severe weather event that occurs.